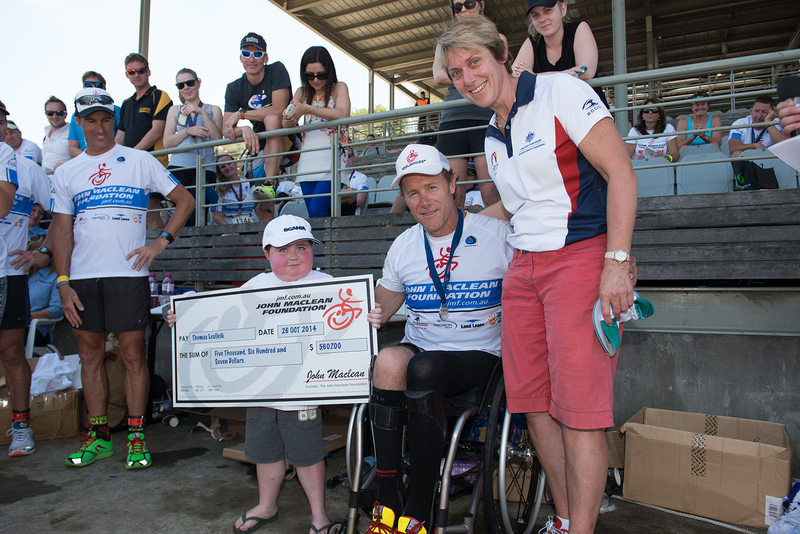 The Great Southern Crossing with JMF – You can support JMF by riding your bike! In previous years you have been among an amazing group of people who have raised funds for us. We are really grateful for your support and wanted you to know that the money you have raised has helped us ensure we continue to help young Australians in wheelchairs remain active and included in their everyday lives. KEEP HELPING US MAKE A DIFFERENCE! Your ongoing support means a lot to us, so we wanted to take this opportunity to let you know that you can continue to make a difference by fundraising for JMF in The Great Southern Crossing which begins on Nov 1, 2015. The Great Southern Crossing is a virtual cycling event utilising Everydayhero’s platforrn’s brand new integration with the world’s most popular cycling app – Strava. The event takes place throughout the entire month of November and entry is free to all participants. The way the event works is by challenging teams of up to 5 or individual cyclists to ride hard through the month of November, using Strava to log their kilometres. Each team’s goal is to log enough kilometres with Strava to virtually cross Australia on a route that will take them 5,200km from Brisbane to Perth. Money raised from this event will continue to provide support and equipment for children who live in wheelchairs and help us grant them much needed equipment to change their lives. 1. Register now to participate in the Great Southern Crossing. 2. Make your participation count by raising money for The John Maclean Foundation. During the registration process you can select to fundraise for and have your own fundraising page automatically set up for you. It’s easy! By the way there are some pretty cool prizes to win along the way! If you are not quite up to date with John’s progress take a look at the picture right and check out the caption! 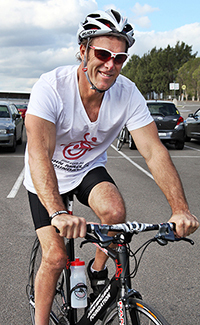 If John can get 118km done in one session then you could attempt 5200km in a month! Another PB today. 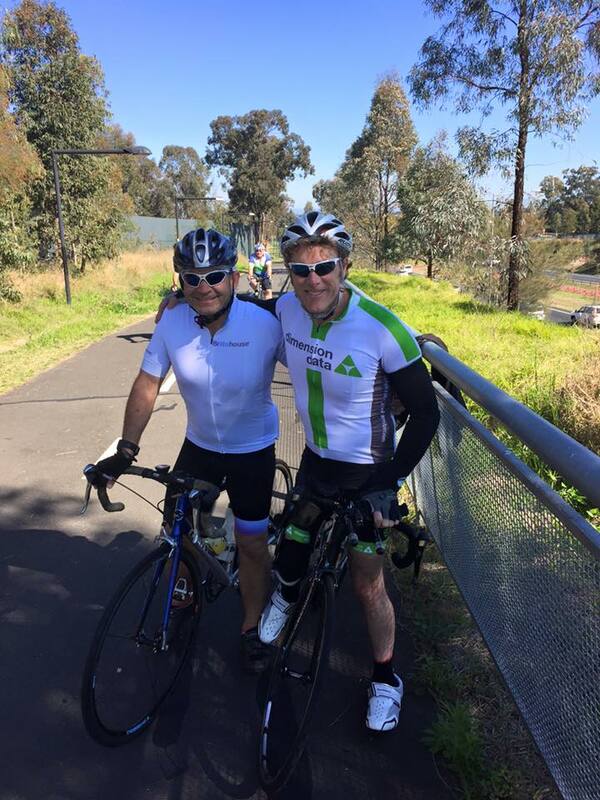 I rode 118kms on my bike with my mate G. Slow and steady will get me to the finish line. This is my plan. [vc_row][vc_column][vc_column_text]If you missed John Maclean’s incredible journey captured by National Nine news … Here it is. Everybody knows that John Maclean is an extraordinary person that has pushed every boundary known to man after being hit by an eight tone truck 26 years ago leaving him an incomplete paraplegic in a wheelchair. 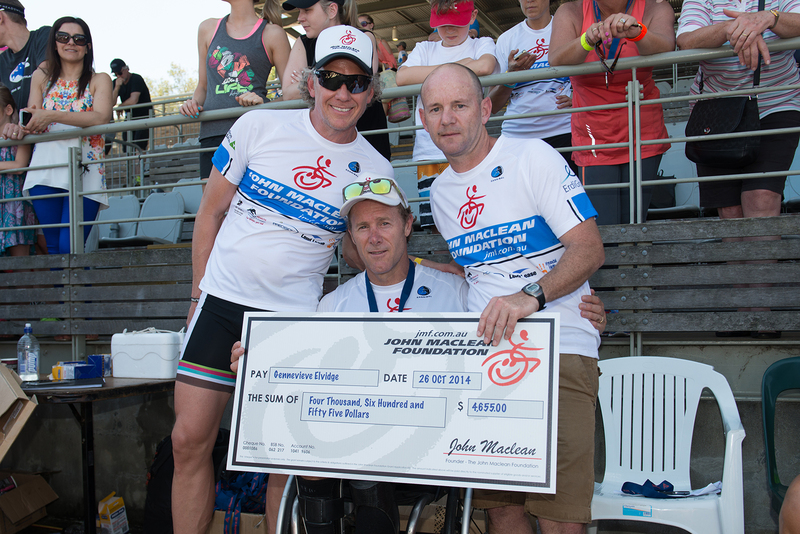 In Penrith on Sunday 26, at Nepean Triathlon, John took the toughest challenge of his life to date, leaving his wheelchair behind and completing the triathlon he was training for when hit by that truck all those years ago as an abled body athlete. 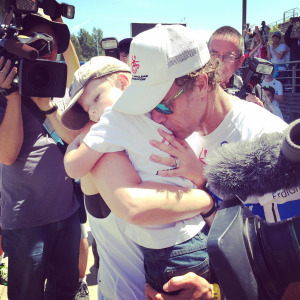 John was surrounded by hundreds of friends and supporters on the day with celebrities like Craig Alexander, Ky Hurst, Steve Waugh, Jana Pittman and Phil Kearns by his side encouraging him through every step of the way. 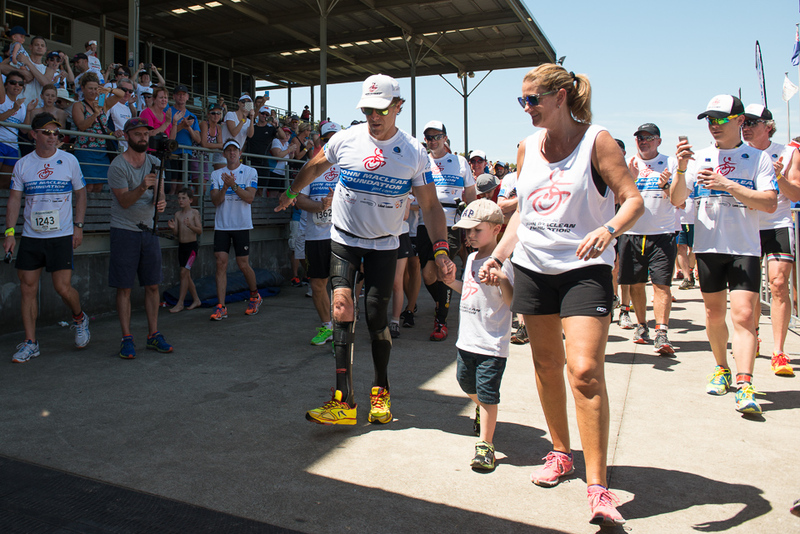 It was the toughest challenge John has ever faced but with his wife Amanda and son Jack by his side he crossed the finish line after a 1km swim, 30km bike ride and an excruciating 10km walk which saw his feet torn to shred with blisters. John about to cross the Nepean Triathlon with Amanda his wife and son Jack. A very special family moment was shared as John, Amanda and Jack all took in what has just been achieved. 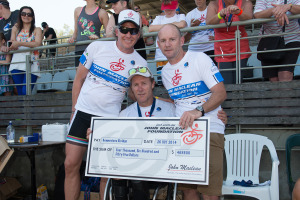 [vc_row][vc_column][vc_column_text]We are so proud to announce our next round of amazing Grant Recipients, which are being introduced next weekend at Nepean Triathlon in Penrith. JMF will be presenting five fantastic families with grants for equipment they so desperately need to make a difference to their children’s lives. It is all thanks to our amazing Sponsors and Fundraisers that we are able to give away $30,000 this Sunday, October 26th in Penrith after the Nepean Triathlon. Cheeky Little 2 Year old Gennevieve will be getting her very own set of wheels enabling her to chase her five siblings in the play ground. Gennevieve is a gorgeous and very cheeky two year old girl with Spina Bifida and Hydrocephalus and desperately needs a wheelchair. 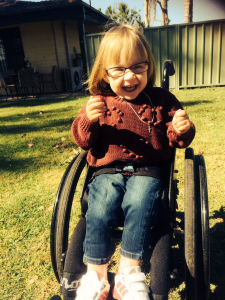 She currently loans a wheelchair from Northcott, which is unfortunately too big for her. Gennevieve has been waiting for an extended period for a wheelchair of her very own that fits and will enable her to have independent mobility, better access the community and play outdoors with her five siblings. What child does not deserve the freedom of independent mobility and the simple pleasures of playing and living a life full of smiles. Come and join us in Penrith on Sunday and be a part of a very special celebration. John Maclean – Catch me if you can! If you are looking for inspiration look no further. 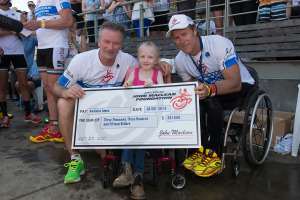 John Maclean is putting everything on the line on October 26 as he leaves his Wheels in transition and takes on Nepean Triathlon #JMFWAVE as an abled body athlete. John will be joined by Sporting Legends like Steve Waugh, Ky Hurst, Phil Kearns and Jana Pittman along side 150 of his close friends and almost 2000 other competitors in Penrith. John never gave up hope of walking again and now he is achieving things that are astounding the medical world and redefining what might be possible for people with spinal injuries. Former Australian Cricket Captain Steve Waugh will be swapping his whites and donning a wetsuit and Lycra as he takes on his first triathlon challenge with John at the Nepean Triathlon. “I’ve known John Maclean for over a decade now and I still marvel at his amazing attitude and enthusiasm to confront each and every challenge with 100% commitment. So when he invited me to join him in the Nepean Triathlon I immediately felt compelled to be a part of this adventure. Take a look at this video which shares with you what John has achieved and footage that shows exactly where he is headed. Support John and the John Maclean Foundation by donating to this Event and help inspire young Aussies in Wheelchairs to reach for the stars in everyday life, just as John has. 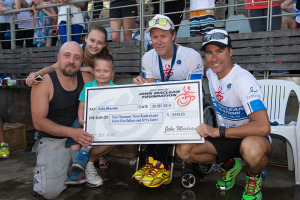 John’s dream of completing Nepean Triathlon in October as an abled bodied athlete in the #JMFWAVE is becoming a reality as seen in this footage with him walking unaided and looking strong for 1km. Support John by registering for the #JMFWAVE, the 5km WALKTHETALK or donating to JMF. Join us and be a part of history in the Making. John was hit by an 8 tonne truck that left him an incomplete paraplegic in a wheelchair whilst training for Nepean Triathlon. 26 years later he is returning, leaving his wheelchair behind in an historic attempt to complete the 1km swim, 30km bike ride and 10km run as an abled bodied athlete. As each week passes John is getting stronger and his dream is becoming closer to a reality. 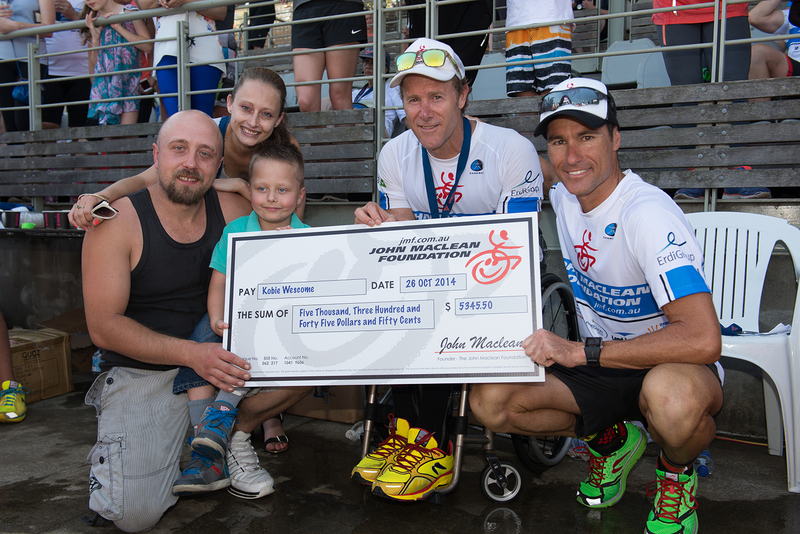 Join John at the Nepean Triathlon as a part of the JMF Wave and together we can swim, bike and run to the finish line.